It's an unexpectedly 'souped-up' take on an old classic. Nintendo had previously said that three new games would arrive on its instant-access NES catalogue today, and it's delivered on its promise -- and then some. In addition to the anticipated Solomon's Key, NES Open Tournament Golf and Super Dodge Ball, Nintendo's also released a fourth game -- a hyped-up spin on a Zelda classic. 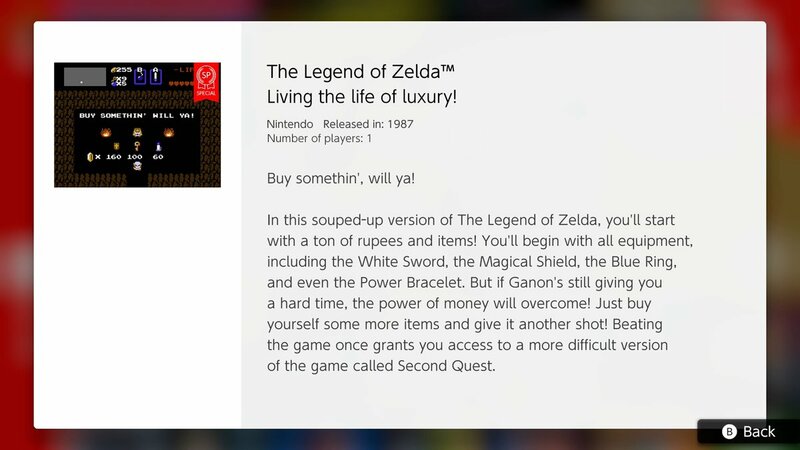 Called The Legend of Zelda – Living the life of luxury!, the game is described as a "souped-up version" of an old favorite, where players start with loads of rupees and equipment. With all these once hard-won items in your possession, the game will no doubt be a whole lot easier and quicker, but once you beat it you'll get access to another "more difficult version" called Second Quest -- which is basically the original game. Essentially, it's making the classic a bit more approachable for newcomers. It's not clear yet whether this one will take a more traditional approach to Link's adventures or will still play out "luxury" style, but old-school Zelda fans and new gamers alike probably won't waste much time finding out.